Volunteers can make a huge difference by giving 30 minutes a week to work with a child and parent. Can you give 30 minutes a week to change a child’s future? 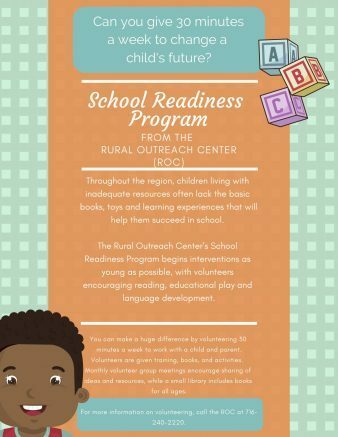 The Rural Outreach Center (ROC) in East Aurora is in search of dedicated volunteers to assist with their School Readiness Program. A volunteer training session has been scheduled for 6:30 p.m. Tuesday, Feb. 26, at the ROC, located at 730 Olean Road. Volunteers can make a huge difference by giving 30 minutes a week to work with a child and parent. Volunteers are given training, books and activities. Monthly volunteer group meetings encourage sharing of ideas and resources, while a small library includes books for all ages. The Rural Outreach Center is a nonprofit organization offering a wide variety of social services for those living in Western New York’s rural communities. For more information on the ROC, please call 240-2220, visit www.theroc.co or follow the Rural Outreach Center on Facebook at www.facebook.com/TheRuralOutreachCenter for frequent updates. Be the first to comment on "Rural Outreach Center seeks School Readiness Program volunteers"